The deposit is non-refundable, if canceling within 7 days of arrival the full amount of your stay will be collected. If cancellation occurs prior to 7 days of your arrival you will be refunded the full amount of your stay excluding the deposit. -There is no smoking in the rooms a per Florida State law. Designated smoking areas with ashtrays can be found on the property. Smoking in any room will result in a $300 damage charge. - There must be at least one individual 25 years of age or older staying in each suite booked. We reserve the right to require proof of age upon request. Liabiity -this property is privately owned and the management reserves the right to refuse service to anyone and will not be responsible for accidents or injury to guest or for loss of money, jewelry or valuables of any kind. Dispute/Resolution- we pride ourselves in our customer service and will do our best to resolve any issues that may arise during your stay. However, events beyond our control wil not result in refunds. Force Majeure -We reserve the right to change the room booked to an equivalent room, should the room become unavailable for any reason. -Space must be booked exactly for arrival and departure, Early departure will not result in a refund. - All rates are subject to county and state taxes. - Be courtious of other guests: no loud music, no running or jumping in suites. 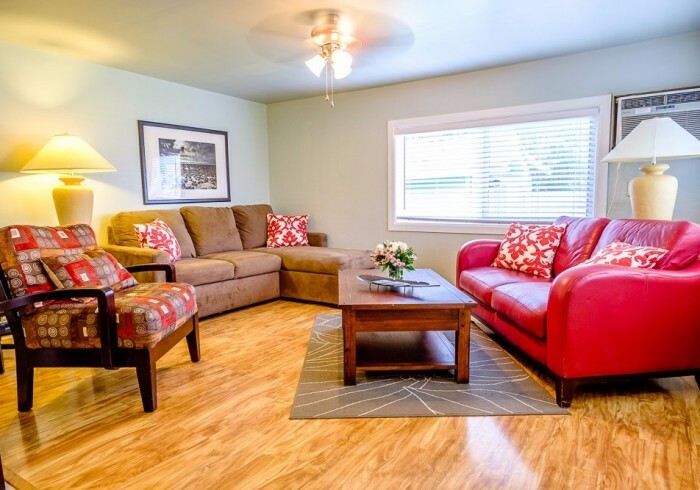 Our Myerside apartments are like vacation rentals, but your experience is very much like enjoying a boutique hotel .Myerside is a magical 1-acre property that has lots of common areas and each unit has its own private outdoor living. Spend the day relaxing at the Myerside pool or get free passes to the Bay Oaks community center, right next door, where there is a kid’s water park, basketball court, state of the art workout facility, pickleball, baseball, Frisbee golf, tennis and more. On the Myerside acre are free WIFI, gas barbecues, fire pit, tikki hut, hammocks, games, kids sand pit - you can chill in a hammock or socialize with others. We offer on-site coin laundry and at our office, you can sign out beach chairs, umbrellas, get change, buy stamps, enjoy a book exchange and get a game or movie. At Myerside, we believe in providing our guest with the best possible customer experience. Our goal is that you come back and stay with us again, so we are there to improve your experience. Let us know how we can do that for you. We are one of the few places that welcome friendly dogs, but let us know in advance so we can review fees and rules with you. Located in the historic " Heart of the Island" district, Myerside is historically recognized by the Town of Fort Myers Beach. But we especially love the location because it is a lovely walk on the beach to the pier in Times Square, or if you take the road, you will hit all kinds of restaurants and bars. We are literally surrounded by the town Bay Oaks Community Center and the Town “state of the art” library. But lets not forget about the beautiful 7 miles of beach, just one minute walk away, with not one but two public beach accesses just yards away from the property. Then, just around the corner learn about the town history at the Historic Cottage, or get back to nature at Matanzas Pass – a free access 60-acre park that has you hiking to the bay for fishing or just to see the moon rise. Matanzas Pass Preserve offers free tours. You don’t have to go down town to enjoy good restaurants. The Historic district has fine dining seafood or road house restaurants, RIGHT ON THE GULF! Or, if you prefer German or Mexican, it is literally right here in our historic back yard. Take the kids for after dinner ice cream and rock in the over-sized rocking chairs, while taking in the view. You can drive or take the town trolley up island to Publix as well. But most importantly the BEAUTIFUL SUNSET IS THE BEST SHOW OF THE DAY, EVERY DAY! Our objective is to make your stay relaxing and as private or social as you want. Staff is on site, but because the property is so big, you may not see them, so just give us a call and someone will meet you at the office in just a few minutes. We will often organize a guest barbecue, pot luck, or musician in the tikki hut, but don't hesitate to use it yourself! If we don't do it, help yourself to lighting the fire pit and enjoy a night around the fire. We try to make it so you can do it yourself. But if you can't, give us a call! A stay at Myerside means you don’t need a car. Even if you are not a walker, there is a free open air tram that takes you from Myerside, through down town and right to the North End amazing Bowditch Park. Then there is a Trolley that leaves Lovers Key State Park in the south end and travels all 7 miles of the island to the north end. The trolley has capacity to hold your bike if you want to spend the afternoon touring lovers key state park, go kayaking from Mound House or Lovers Key, rent a boat from Fish Tale Marina, or just hang out in Newton Park were there are bathroom facilities. UBER and LYFT are available, as well as numerous taxi services. Myerside is a 35-minute drive from South West Florida International Airport and one hour from Punta Gorda Airport. We are on the Sunset Side of the state, and a 2 hour drive from the east coast’s Miami and Fort Lauderdale airports. At Myerside, we are always trying to improve our customer experience and engage them in what our community has to offer, which includes free access to our Bay Oaks Community Centre, restaurant and local attraction coupons as well as, for guest who stay with us more that 2 nights, 2 free event passes, (kayak or walking tour) @ the Fort Myers Beach Mound House. At the Mound House you will explore of one of the most powerful ancient cultures of Southwest Florida. Immerse yourself in the natural environment of Estero Bay with guided kayak eco-tours. Stroll the shoreline on a beach walk or experience fun interactive programs for all ages. Travel the Great Calusa Blueway Paddling Trail, navigating the same waters that this ancient coastal tribe once fished. Then, learn about their culture and how they used natural resources to create tools and weapons they used to sustain and defend their domain. Discover an ancient island life beyond anything you’ve ever imagined, through hands-on experiences atop a 2,000-year-old Calusa Indian Shell Mound. Once you book with us, ask us how you can take advantage of this offer. Meanwhile, to learn more about the Mound House, go to moundhouse.org. Please note there are no tours on Sunday and Monday. Space is limited, so book soon! Address 1: 145 School St.